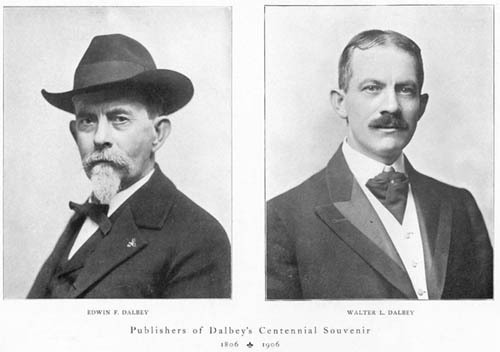 Edwin F. Dalbey and his son, Walter, were successful merchants in Richmond. Edwin owned a furniture store for many years, while Walter started his career working for the Richmond Palladium before coming to work for his father in the furniture business. Legend has it that Edwin received a camera in trade for some furniture, and the two men spent a great deal of time playing with it and learning the craft. By 1896, they had produced a huge number of images of people and places in Richmond, and they decided to compile a book which they called a "Souvenir." In March 1898, they purchased the studio of Rolland Stigleman at 826 Main Street and became full-time professional photographers. Edwin died in 1912, and Walter continued operating the business until the late 1920s when he retired. Walter died in 1946. The first Souvenir was published by the Nicholson Printing and Manufacturing Company of Richmond, who printed 3500 copies. Another smaller edition, sponsored by the Knollenberg Department Store, was published in 1904, but the most popular was the "Centennial Souvenir," published in 1906 to commemorate the anniversary of the arrival of the first white settler to the Whitewater Valley. 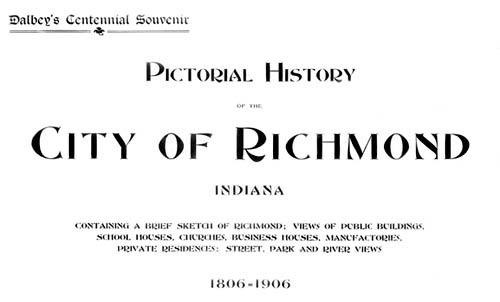 It is billed as a "Pictorial History of the City of Richmond" but the vast majority of the photographs are contemporary. The book opens with an eight-page textual description of the city, again, mostly contemporary in nature, but including some historical information. For the most part, each of these books is a commercial for the City of Richmond, and subtle advertising is evident in many locations. Today, however, these books are invaluable documents that provide a glimpse into the daily life of a Midwestern city more than one hundred years ago. In their pages we can see what people wore, what they bought, and how they traveled. We can view buildings that no longer exist, and we can see buildings that remain in a new light. 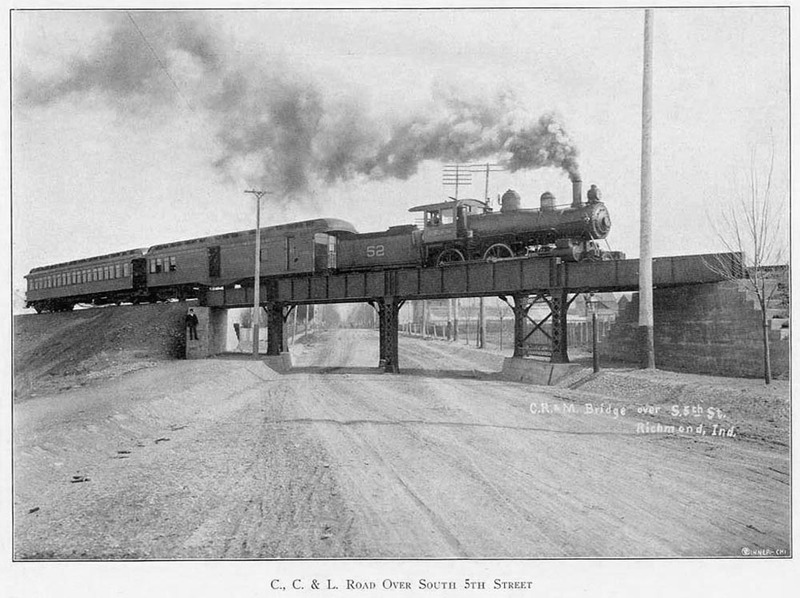 This online presentation concentrates on those structures that current residents of Richmond will recognize. Many of these pages contain links to "Then and Now" pages, which show how the buildings currently appear. The 1906 Dalbey's Souvenir included 272 pages of photographs, a small fraction of which are included in this presentation. Those presented here were chosen because, with the exception of "Schools," nearly all buildings and scenes depicted in them exist today. While many of the schools have been replaced by newer buildings, nearly all of the 1906 structures have been demolished. They are included because a great many Wayne County residents will remember them.